Resistance, the latest in Dark Horse’s long line of impressive Aliens offerings, sits in an interesting position. Serving as a sequel of sorts to both the immensely entertaining Aliens: Defiance limited series and the heart-poundingly intense Alien: Isolation video game, Resistance features a reunion between the heroines of each particular story, Zula Hendricks and Amanda Ripley. After each woman’s determined attempts to keep the Xenomorphs out of the reach of the Weyland-Yutani Corp in their respective stories, it seems that they both have ultimately failed in their missions. Because, as it turns out, Wey-Yu have inevitably managed to obtain Xemomorph samples, and it’s now up to Zula and Amanda to track these samples down and destroy them. In theory it’s a fascinating idea, the prospect of fleshing out both characters even further and intertwining their narratives to form a united front against the looming corporate threat. The execution, however, is unfortunately more than a little lacking. 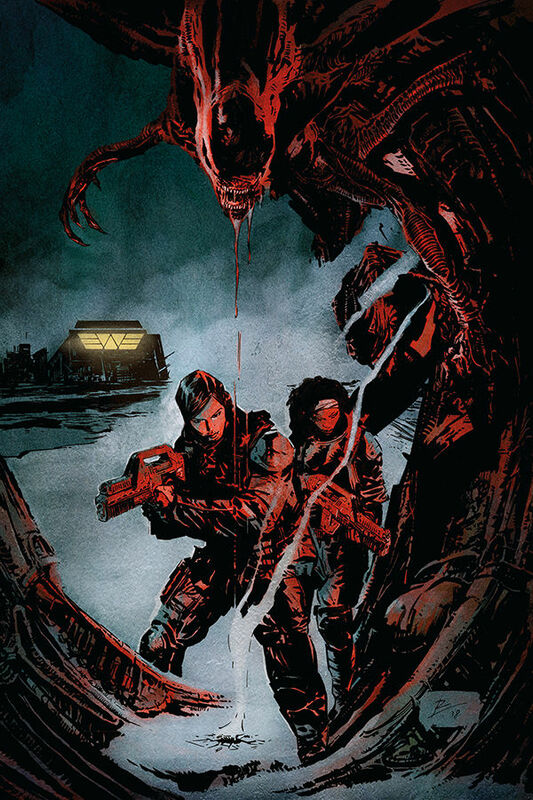 Brian Wood has a great track record with the Aliens franchise, and as a writer in general, but the whole thing feels incredibly superficial here. The dialogue and interactions are perfunctory at best, there’s no heart, no real investment from the characters, and Amanda Ripley’s dispassionate narration serves as significant downgrade from the tense, introspective thoughts of Zula in Defiance. It also probably doesn’t help that Robert Carey’s artwork feels incredibly stark and sterile throughout, with an overabundance of empty space and a real lack of expression from his characters. Granted a lot of this probably comes down to Wood, who lays out dozens of wordless panels along the way, but rather than a feeling of tension or suspense, these long periods of silence end up feeling empty and unsatisfying, almost like dialogue or narration has been omitted by mistake. The final pages provide a glimmer of hope that things may pick up as the series unfolds, but with absolutely no sense of urgency from either of the lead characters and no real hook to draw the reader in (aside from the fact that this series serves as the continuation of two previous much-loved Aliens stories), there really isn’t much to get excited about here. I’m slapping on an extra half star for the potential of the premise, but as a first issue this feels like a bit of a missed opportunity. There are great ideas here, along with great characters and a writer who clearly knows how to deliver a top-notch Aliens story, but it just doesn’t all seem to be coming together just yet, for whatever reason. I’ll probably pick up the second issue out of loyalty to the franchise, but I’m really hoping for a marked improvement in terms of tension, urgency and some real stakes if this series is going to keep me reading much longer than that.